Love Potion No. 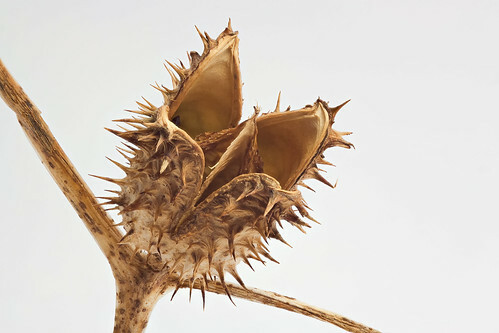 9 (Datura Pod), originally uploaded by jeffsmallwood. This pod is less than 2 inches long and the shot is focus stacked from 8 images I took in my softbox. I was out in the farm field behind the house with my boys (we were shooting AirSoft guns) and noticed how cleanly some of these pods had opened. We've had a very mild winter so far with a lot of good weather and a large number of the pods I found weren't broken or falling apart. They were packed with seeds and in various stages of opening. I brought some of the more interesting ones back with me, arranged them in the softbox and tried several different shots. Given the detailed textures and spines, I wanted to shoot macro so focus stacking was the only option to get it all in. I posted this shot at the original resolution (4752 x 3168) so you can see the details of the spines. So what did I learn? I've seen these pods my entire life (called them thorny apples), small plants around knee/thigh high with the spiny fruits but never knew exactly what they were. I looked them up on Google and found out they're toxic and hallucinogenic! It's a species of datura. To quote from the Wikipedia article, "Datura belongs to the classic "witches' weeds," along with deadly nightshade, henbane, and mandrake. Most parts of the plants contain toxic hallucinogens, and datura has a long history of use for causing delirious states and death. It was well known as an essential ingredient of love potions and witches' brews."